Skateboarding began as a sport in the 1970s and was ingrained in American counterculture. As time progressed, the sport became more popular and was embraced by society. Now, professional skateboarders have celebrity status and events are televised. Skateboarding is still seen as a problem by some and can cause injuries and property damage. For these reasons, many states, including Florida, have laws that skaters must know before they start to perform tricks in public. Without knowing skateboarding laws you could get a ticket or get thrown in jail for skateboarding. Florida state statute number 316.0085 states that the government "does not grant authority or permission for a person to engage in skateboarding, inline skating, paintball, or freestyle or mountain and off-road bicycling on property owned or controlled by a governmental entity unless such governmental entity has specifically designated such area for skateboarding, inline skating, paintball, or freestyle or mountain and off-road bicycling." 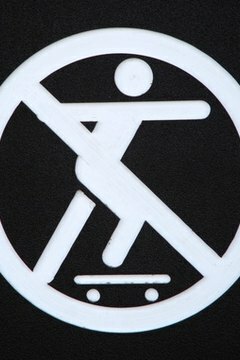 This means that you cannot skate on property owned or controlled by the government unless it specifically says you can. Parks or specially designed skate parks typically allow skateboarding. There is no national law requiring an individual to wear a helmet while skateboarding, but Florida is one of many states that passed a statewide rule making it necessary. The law requires that anyone under age 16 must wear a helmet when riding on a motorcycle, bicycle, skateboard or rollerblades. If you are under 16, make sure you don't get caught without head protection. The Florida State statutes also say that government and private property owners are not liable for any injuries or damages that occur while an individual is skateboarding without permission. The statute says, "It is also recognized that risks and dangers are inherent in these activities, which risks and dangers should be assumed by those participating in such activities." The rules also state that the government is not liable for issues that occur in skate parks or other areas where skateboarding is allowed. Waller, Chris. "Skateboarding Laws in Florida." , https://legalbeagle.com/6319208-skateboarding-laws-florida.html. Accessed 20 April 2019.